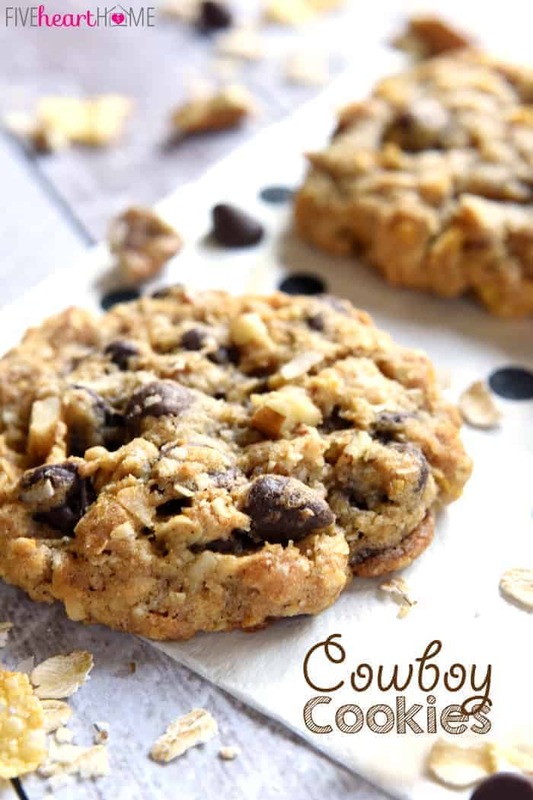 Cowboy Cookies are soft, chewy, and totally addictive, loaded with a variety of flavors and textures — from oats and coconut to chocolate chips and pecans! A few days ago I had a craving for cookies, which happened to coincide with my need to come up with a little sweet treat for an upcoming Girls’ Night Out. However, I knew that if I made cookies for my mom get-together, I’d have to ensure that there would be enough extras for my demanding whiny hungry minions at home. 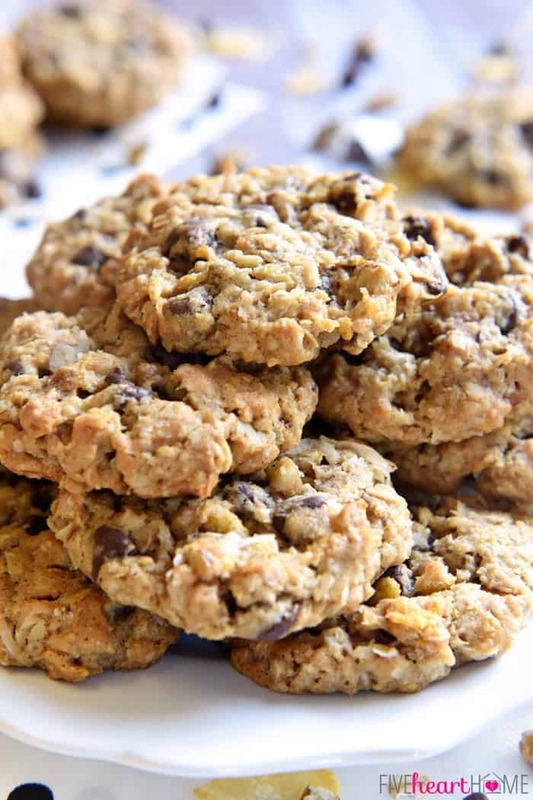 So I decided to bake Cowboy Cookies because, not only does this recipe make a huge batch, but they’re also so loaded with goodies that there’s a little somethin’ in there to please everyone. 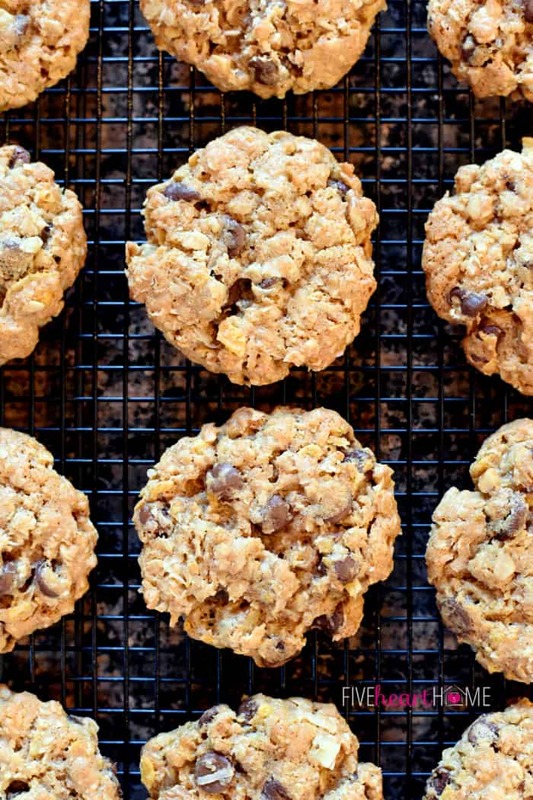 If you’ve never had the pleasure of sinking your teeth into a big, chewy Cowboy Cookie before, allow me to introduce you to these everything-but-the-kitchen-sink wonders. 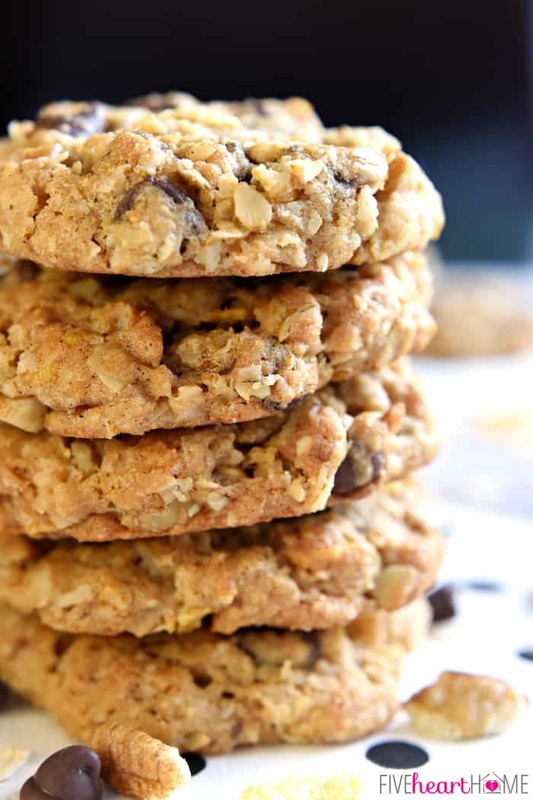 They’re kind of like super loaded oatmeal cookies full of contrasting textures and flavors. First you have the oats, of course. But there’s also chewy coconut, creamy chocolate chips, crunchy pecans, and — the secret ingredient — oh-so-humble cornflakes! I know it sounds crazy, but the flakes add surprising little pockets of crispness to these soft, chewy treats. Yum. Chewy is definitely a key word in describing these Cowboy Cookies, which hopefully explains why I’ve used it no less than five times in these first few short paragraphs. No, my thesaurus ain’t broke…there’s simply not a more fitting adjective for these cookies. They key to ensuring their chewy (sorry) texture, however, is to make sure they don’t spread too thin or become overly brown and crispy due to an extended baking time. If you bake your cookies immediately, simply scoop the cookie dough into mounds on the cookie sheet without flattening. There should be some spread as they bake but not too much. If you make your cookie dough ahead of time and end up refrigerating it before baking (which I did with this batch because tantruming two-year-old), let it come to room temperature for a few minutes before forming into balls and slightly flattening. As usual, I start out the recipe in my KitchenAid, creaming the butter and sugars together, adding the eggs and vanilla, and then blending in the flour mixture. At that point, however, I transfer this basic cookie dough into a giant bowl (I actually use a huge stock pot, because it’s the biggest receptacle I have), where I then add the masses of chunky ingredients. I use a big wooden spoon to incorporate everything and then it’s time to scoop and bake, with nary a chocolate chip ricocheted onto the kitchen floor. Believe me, this method is way better than watching your mixer do the macarena across the countertop as it tries to incorporate all of those chunks in its overloaded mixing bowl. 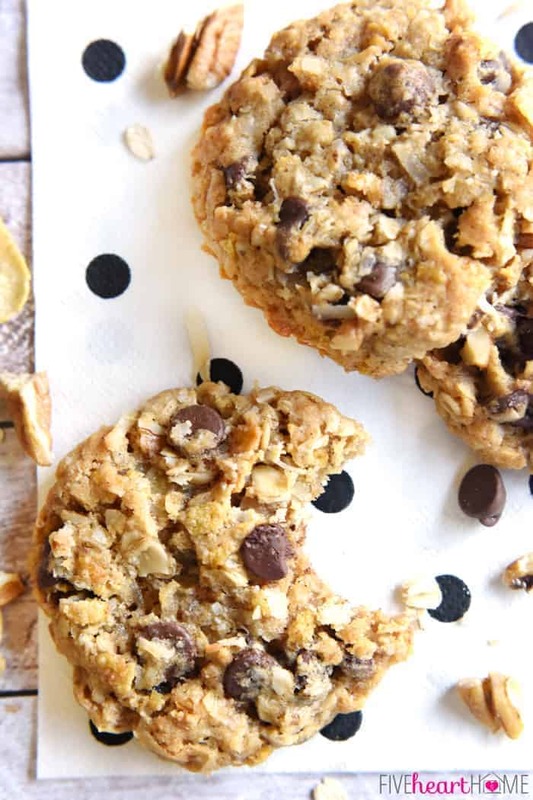 And there you have it, folks…these Cowboy Cookies are everything you’ve ever wanted in a cookie and more! They will satisfy your inner Cookie Monster while making your friends (because there’s enough to share!) and family members (meltdown-prone toddlers included) very happy. That must not have been the answer her little heart was longing to hear, because after having this identical exchange approximately two dozen more times, she proceeded to scream for a cookie for the next hour. I fortified myself with an extra cup of coffee and stood strong, friends. But she probably sensed that I will most likely cave if she engages me in battle for a second day in a row. 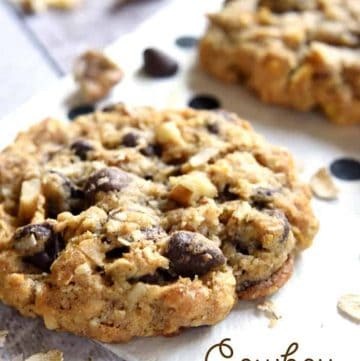 Cowboy Cookies are soft, chewy, and totally addictive, loaded with a variety of flavors and textures -- from oats and coconut to chocolate chips and pecans! Position oven rack in center of oven and preheat to 350°F. Line cookie sheets with parchment paper. In a medium bowl, whisk together flour, baking powder, baking soda, cinnamon, and salt. In a very large bowl, use an electric mixer to cream together butter and sugars. Beat at medium-high speed until light and fluffy. Scrape down sides, reduce speed to medium-low, and blend in eggs, one at a time. Add vanilla and beat until well incorporated. With mixer on low speed, blend in flour mixture until just combined. 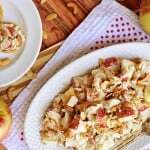 Use a large wooden spoon to stir in oats, chocolate chips, coconut, cornflakes, and pecans. Use a cookie scoop or large spoon to scoop mounds of dough (approximately 3 tablespoons per cookie) onto prepared cookie sheets, spacing about 2 inches apart. Bake for 12 to 15 minutes or until cookies are set and edges are beginning to turn golden brown. 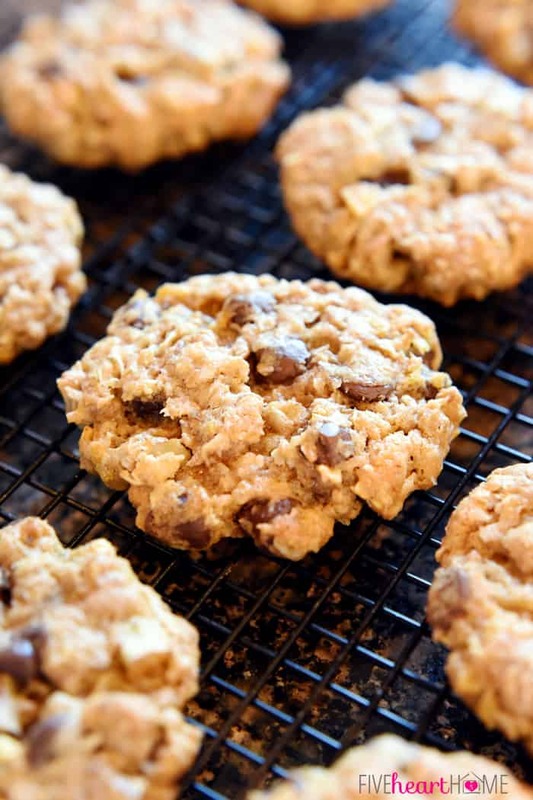 Allow cookies to cool on baking sheet for 5 minutes before transferring to a wire rack to cool completely. For extra flavor and crunch from the pecans, I recommend toasting them by spreading them on a baking sheet and baking at 350°F for 7 to 10 minutes or until lightly browned, watching carefully. 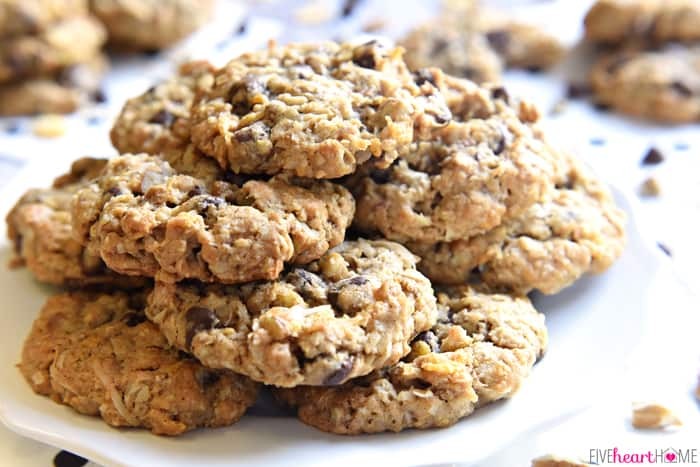 If you use a stand mixer and you don't think all of the ingredients will fit in the bowl, prepare the cookie dough through the step of blending the flour mixture into the butter mixture. Then scoop the dough into a larger bowl (or pot) and mix in the oats, chocolate chips, coconut, cornflakes, and pecans using a wooden spoon. Cookie dough may be tightly covered, refrigerated, and baked later. Allow the cookie dough to sit at room temperature until it's warm enough to work with, and then form into 1 1/2-inch balls. Space out the balls of dough on the cookie sheet and slightly flatten them until they're about 2-inches across. Bake as directed. These look super yummy! I love them name too. My daughter and I will definitely need to make these. Pinning for later. Thanks so much, Kristen! I appreciate the pin and I hope that you and your daughter enjoy these when you try them. I wish I could take credit for naming them, but I think it’s been around since before my time. 😉 Have a great week! As the fortunate recipient of two of those cookies at girl’s night out (really wish I had grabbed more to bring home! ), I have to say those were probably some of the most delicious cookies I’ve ever had. Serious yum-factor. Now, to make them for myself…. You are too sweet, Clare! I had so much fun the other night and I’m glad that you enjoyed the cookies! You should definitely make a batch soon…I can think of a cute little 4-year-old who just might enjoying sharing them with you. 😉 Thanks for stopping by…hope you have a wonderful week! Oh Girl! My MOST favorite cookie in the world…one my dear mama use to make!! I’ve not tried it with cornflakes, but you can be sure I will the next time around. Yours look absolutely mouth-watering. I.WANT.SOME…NOW! =) Thanks for sharing at Weekend Potluck. Awww…I bet your mama’s cookies were the BEST, Marsha! The cornflakes are a fun twist and give this version some extra texture…you’ll have to let me know what you think if you try them! Thanks so much for stopping by and happy Monday! I have been wanting to make Cowboy cookies now for a week! 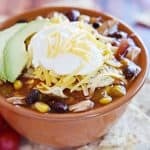 I came across this recipe and will definitely try it! No peanut butter ? 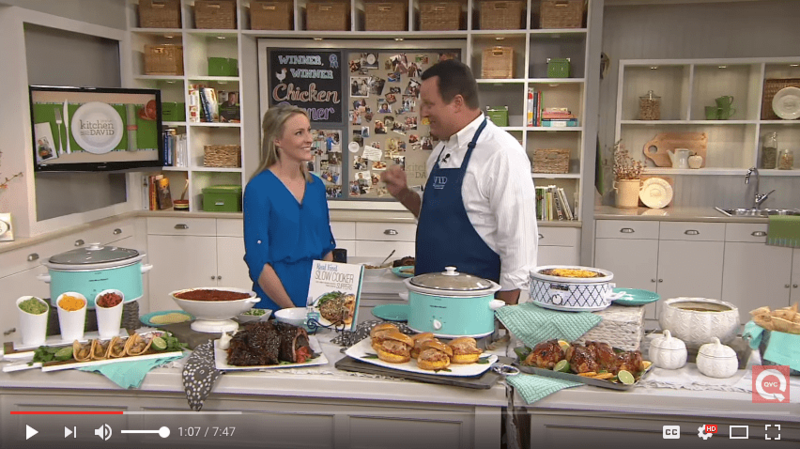 I’m a big fan of everything but the kitchen sink cookies 🙂 and there is something for every one in there – delicious!! Thank you, Heather…I couldn’t agree more! I love regular chocolate chip cookies as well, but these make them seem downright boring. 😉 Thanks for stopping by and I hope your week is off to a great start! Thank you, Shannon! I hope these are a hit with your family if you end up trying them. 🙂 Have a fantastic week! Thanks so much, Amanda! Hope you enjoy these! And I may have ended up sharing a cookie with my daughter for breakfast just about every day until these were gone…ooops. 😉 Hope you’re having a great week…I appreciate you stopping by! 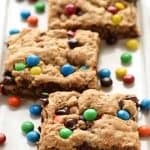 I haven’t had cowboy cookies in a long time, these look like just the recipe to try! 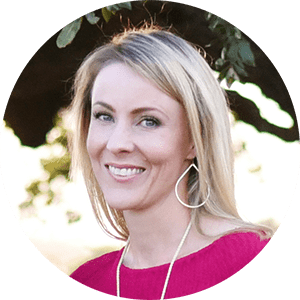 I forget about making Cowboy Cookies for long periods of time, too, Chanelle…and then I rediscover the recipe and wonder why I waited so long between making them! 😉 Hope you enjoy this version of them. Happy Friday! Hello Samantha, my daughter plays soccer and I made these cookies yesterday and took some to her practice and all the girls (and the coach) loved it! They flew quickly. 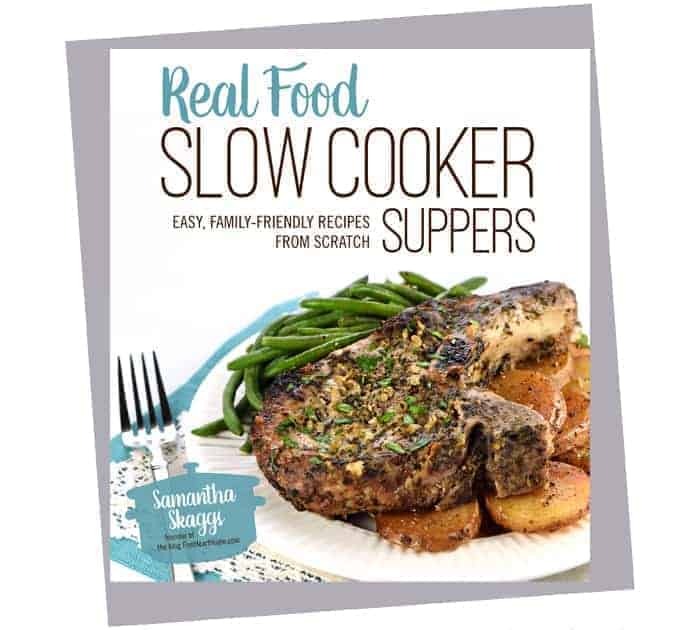 Thanks for another awesome recipe! 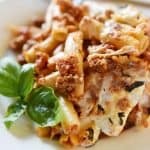 Very delicious and easy to make. Yay! I’m happy to hear that everyone loved these cookies, Madelyn. I kind of wish I had one now! 🙂 Thanks for your sweet comment and I hope that your November is off to a fabulous start! So much going on in these cookies and all of it I love! Me too, Laura! These are busy cookies but they’re oh-so-good. 🙂 Hope you have a chance to try them soon! Came out delicious AND pretty! Thank you, the Hubs will think someone broke in and baked cookies while he was at work. These did not puff up for me they are flat. I don’t know….I used the baking soda and powder. Definitely think corn flakes need crushed up a little. These cowboy cookies came out amazing!!!! Such a great recipe. My family loved these cookies and they are definitely a keeper. Have you tried freezing the cookie dough? Sometimes I’ll make cookies and freeze the dough in individual balls to bake later.. I’m wondering if that might change/mess up the cornflakes? I haven’t tried freezing this dough, Amber, but I bet it would be fine. The cornflakes are chewy rather than crunchy by the time they bake anyway. 🙂 Please let me know how the cookies turn out if you decide to give freezing a try! 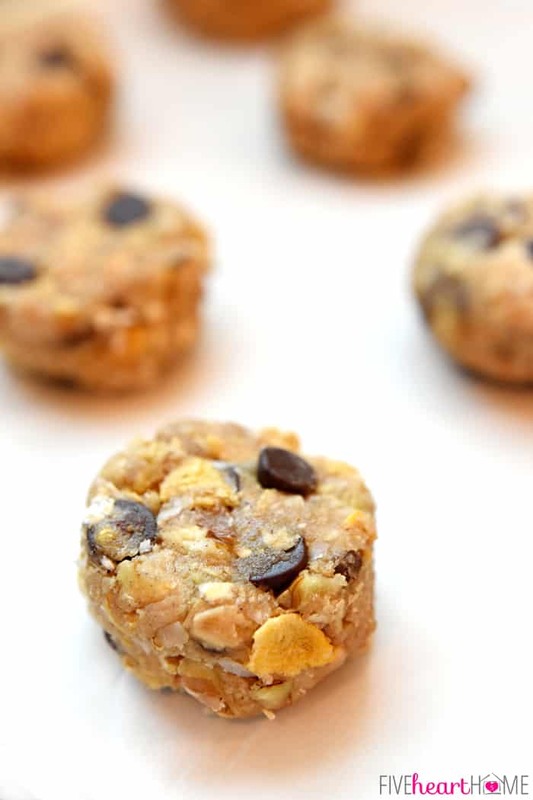 Made these today and used golden raisins instead of chocolate chips. They’re delicious.